Computerized tomography (CT) scanning is a technique of slice imaging based on the use of X-rays, allowing reconstruction of 2-dimensional or 3-dimensional images of anatomical structures. 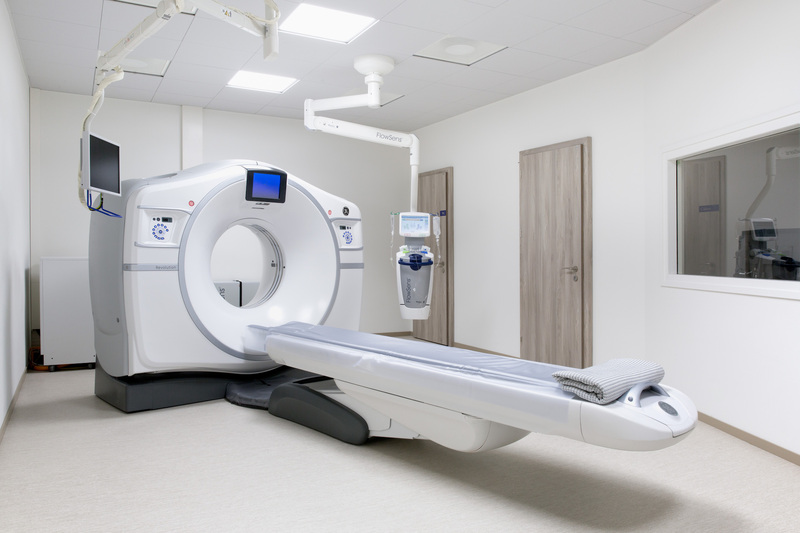 We have in our institute a last generation high-tech CT scanner, the General Electrics (GE) Revolution HD one. Our CT scanner is equipped with a Gemstone detector providing high-quality images with a very low radiation dose (using ASIR-V technology). Spectral imaging (also called dual-energy) is based on decomposition algorithms and offers the opportunity to generate material-specific images (such as iodine contrast media, calcium, fat and uric acid), and to provide qualitative and quantitative information about tissue composition and contrast media distribution. Such imaging thus provides functional information in addition to anatomical resolution usually provided by CT scanner). This imaging is therefore able to create images that exclusively show iodine distribution: these iodine-specific images increase tissue contrast and amplify subtle differences in attenuation between normal and abnormal tissues, thus improving lesion detection and characterization. In addition, it enables computational removal of iodine influence from a CT image, generating virtual non-contrast images. This technique may also be used to reduce the radiation dose by decreasing the number of phases in a multiphasic CT examination. CT applications in terms of post-processing are wide and advanced, with among others virtual colonoscopy. Our CT scanner is provided with an interventional module allowing to perform procedures under CT guidance (e.g., spine infiltrations). © Copyright 2017. All rights reserved. A Wizyweb creation.